This, truly, is the king of all sauces. I feel almost like I’m doing it an injustice by setting aside only one meager review for such a lofty and complex topic. Indeed, I could fill an entire site with the vast volumes of subtleties, effects, and sheer culinary poetry contained within the single subject of “duck sauce.” And if I thought I’d get more than 10 visitors a year at BenRatesAllDucksauce.com, I might just do it. The thing most people are somehow unable to understand is that there is a huge, huge difference between the different kinds of duck sauce you are likely to stumble across in your travels. Each brand, each method of distribution, even each method of storage greatly affects the quality of the sweet, sweet sauce you’ll find there. In a way, duck sauce dedication is a lot like wine appreciation. Buying duck sauce at the average American supermarket is a lot like buying a twist-off capped bottle of wine at some backwoods gas station. Many people wouldn’t think twice about it. Many other people would sooner bash themselves upon the head with the bottle than actually partake of whatever disgusting concoction is borne within. Generally speaking, the best duck sauce is usually the homemade stuff from your local Chinese restaurant. Very few people make the effort to ask about the homemade sauce and usually walk away with high fructose corn syrup packets when the real stuff is only a few feet away. The second best way to get duck sauce is in the higher end packets. Unfortunately I’ve been unable to find much information on this on the Internet, but suffice it to say that there are many different kinds of duck sauce packets you’re likely to find. “WY” is probably the most popular in the States, and it’s a good sauce, but not a great sauce. “WY” gets a B on the BRIA Duck Sauce Scale, which is a respectable rating but nothing to stash by the caseload in your basement. Another popular packet brand is the stuff with the panda on the cover (see below), but that brand only gets a C on the scale. This stuff is usually a sign of restaurants that don’t care about their customers, or are actively trying to go out of business. But even the worst packet is a little better than the horrid generic stuff you find in dusty jars hidden in shadowy corners of western supermarkets. Stay away from these things if you value your ability to taste things — I can’t stress this enough. This junk is duck sauce in name only, and barely even non-toxic from what I’ve heard whispered from past victims. I wouldn’t even feed this garbage to plants. 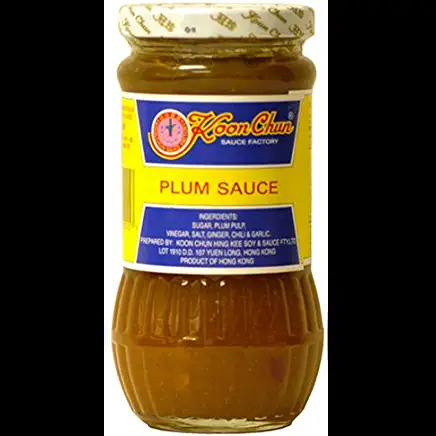 Now that we’ve covered the enormous differences between the different kinds of duck sauce, why is this sauce better than other, non duck related sauces? That turns out to be a deceptively difficult question and, as most things on this site, open to opinion. Some people, I am sure, consider power bars to be a delicious treat and would rather feast upon them than the world’s most succulent roasted turkey. There are many people who enjoy Jerry Lewis films, and the undying antics of Carrot Top, and would be happier if our airwaves were filled with these personalities all the time. This is to say, plenty of people are crazy, and these people might not think duck sauce is the best condiment in the world. Do you want to be one of these people? Brass knuckles have always fascinated me. There’s just something about the odd shape and dubious thought process behind seeking to own them that always awakens my interest. They are technically classified as a deadly weapon, but if the carrier’s intention is indeed the death of his opponent, why not carry a knife or a taser? Clearly those weapons are viewed as “too much”, or, “too likely to cause serious injury.” Brass knuckles are a kinder, gentler deadly weapon. The second thing that’s always intrigued me is the material these things are made out of: brass. Why on earth would they decide to make them out of brass? Don’t “Steel Knuckles” sound more exciting? What about “Ultra Titanium Knuckles.” Surely any of these lend a more lasting mystique to the urban defense experience. Why, then, go with such an outdated metal? The sad answer is that they’re not really made with brass at all. They are “brass knuckles” in name alone, and are more often made out of steel or some other generic hard metal. “So if they’re not made out of brass, where did the name from from,” you ask? I have several theories. In ancient times they were actually made out of brass and we still refer to them by this name today purely out of a sense of tradition. This seemed reasonable at first, but then I remembered that there was never any great “Brass Age” in human development. If they were called “bronze knuckles” this might be easier for me to believe. They were invented by a man named “Mr. Brass” and the term “Brass knuckles” is really just his namesake. I’ve been told this is the story behind the “camel hair brush”, but I’m not sure if what I was told is true or not. You shouldn’t believe everything you read on the Internet. They were originally called something like “fast knuckles” or “task knuckles” and human laziness and slurring of speech eventually led to their name morphing into the ridiculous form we enjoy today. Whatever the history behind these things, I can’t help being interested in them. You may see no difference in whether dark alley denizens choose to carry switchblades or brass knuckles as they roam the dirty streets at night, but for some reason I do. Brass knuckles are classier, somehow, and the perfect accessory to any seasonal evening attire. Clearly the coolest of planets, Saturn really has it all: rings, lots of fascinating moons, a great red spot, and a really cool name. Next to Saturn the other planets look like a bunch of glorified asteroids. When you think of strange worlds floating in space a mental image of this planet immediately springs to mind. Why is that? It’s because Saturn has a classic look. It rotates on a fashionable 27 degree tilt, causing its classy rings to summon thoughts of an old time private detective wearing a tilted stetson during a particularly intense investigation. The planet’s rocky core is hidden beneath thick obscuring clouds, lending an additional sense of secrecy to its already mysterious nature. It is a fascinating astronomical enigma, and it beats the pants of of Pluto any day of the week. A while back I stumbled across mp3s of the Huygens proble landing on Titan, Saturns most celebrated moon. Listen and Marvel to the unearthly splendor of the sensors’ electronic confusion. Gasp at the terrifying speed and uncertainty of its unearthly decent. Shiver as you imagine the murderous -290°F temperature cutting against the tiny probe’s thin metal skin. Does extraterrestrial drama get any better than this? I suppose there is some other pretty cool stuff out there that really gives Saturn a run for its money. The Horsehead nebula is always an amazing sight. Supernovae are endlessly overwhelming. But in its planetary weight class Saturn is a clear champion. The only thing that would make it better is if you could actually stand on its gaseous surface long enough to enjoy the experience instead of sinking immediately into it and being sucked down to the planet’s frightening core. Saturn, you’re such a tease! Food courts are an interesting invention. A dozen or so crappy eating establishments, all vying for the same small quasi-sanitary space, have a problem: there is simply not enough room for all of these establishments to co-exist as separate entities, and if only one or two of the businesses win out over the rest their profits will probably drop due to decreased foot traffic. Solution: Food Court. Like the mighty Voltron, a super-powerful robot created from many smaller, suckier robots, the many crappy eateries merge together to form some new terrible super food monster. The result of this unnatural transformation is very similar to the Voltron/Power Rangers/Devastator brand of super robot: the finished product sorta resembles each of its members but also loses something from each in the process. Your local food court might have a McDonald’s and a Taco Bell and a Pizza Hut, but it’s just not the same as if those restaurants lived next to each other on the same block. The menus are abridged; the prices are often different, and the atmosphere… there exists a very unique food court ambience, which is to say, you’re eating in the middle of a freaking mall, surrounded by obnoxious echoes and sticky seating. It’s not exactly the sort of place you bring a hot date. It’s more the sort of place you look forward to leaving as soon as possible. I often wonder how future archaeologists will view the ruins of our present society. Will they be most fascinated by the fossilized computer parts dug up from Chinese landfills? Will they be smitten by the 500 tons of time-distorted Hello Kitty merchandise? I think anthropologists will be blown away by the sheer profundity of Food Court psychology. Why would financially stable people, at an institution created to exercise economic power (a mall), subject themselves to a dehumanizing trough-like cafeteria setting? Why wouldn’t they spring an extra buck and get a nice sit down meal at a restaurant only a short walk away? It is unanswered questions like these that delay our evolution into a more civilized species. Ben Rates It All, Proudly powered by WordPress.